Make sure your .m file exists in the project and on disk. Make sure it is correct with an @implementaiton-@end block. Open it in Xcode, close it, if the error persist, restart Xcode. 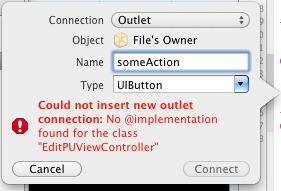 Xcode is trying to write to EditPUViewController.m (in the dealloc method etc.) but could not find it. Also, it always helps to hard-clean the project with ⌘+⌥+⇧+K. Open Organizer then Project Tab. Clear the "Derived Data". Xcode should re-index your project then and code sense should work. At least worked for me. I had a comparable problem when trying to connect an action. To solve it I manually added the IBAction and then XCode allowed me to connect from the button to the code. Go to Xcode -> preferences -> location tab -> derived data -> clear derived dat. After trying for hours I figured that the reason why I couldn't create the IBAction was because I had removed the very last line from my .m file. Xcode automatically adds an extra empty line after the @end delimiter when you create a new Objective-C file. I noticed that .m file was moved inside en.lproj folder. Just delete (reference only) the .m file from the Xcode and moved .m out of the en.lproj. Add it again.Don't worry, you will get all your connections back. It will fix the issue. I got the same error. Restarting Xcode did not fix it for me (I didn't want to reboot). The file was also not in the en.lproj folder (nor in the usual project folder after I deleted it from within Xcode). The fix for me was to re-create the file with a different name (Using different case in the filename alone was not enough to fix it... must be a different name entirely). I ran into this problem when I created a class, deleted it and then created a new one with the same name. The workaround was not to reuse the name of the deleted class, but use a new one. Thus, I'd say it's a bug on the XCode side. You may want to delete Derived Data as well if it does still not work. This seems because of XCode is missing reference or need to refresh manually. In my case, removing the reference of the nib(.xib) and adding it again solved the problem. In my case I had by accident selected the arm64 build. When compiling I got an error but I did not notice that since I was working with the UI trying to connect an action. The error however was exactly the same. After changing to another architecture so the project compiled I could connect the action by holding the ctrl button as usual. In Xcode 9 I had the same error after moving .m files in project from one directory to another. Deleting references to .m files and add them again did solve the issue. I found the ANSWER. When you create a new file (Objective C files) for each view controller, you must check by clicking the box, next to your project name. So that your project includes this file. Otherwise, this error will persist, because your project hasn't connected to the file even though it created it. How to remove a connected action? How to add actions to the subviews of a xib custom view in storyboard?